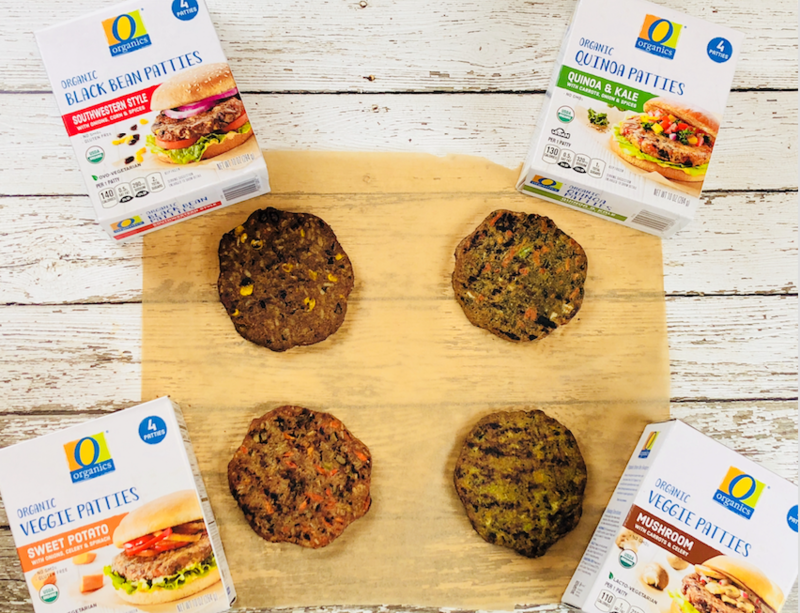 Whether you enjoy a vegetarian diet, or are trying to incorporate more plant-based foods into your diet, Safeway has NEW O Organics Veggie Burgers available in the frozen food aisle as an option. I’m a huge veggie burger fan and when I saw the new O Organics Veggie Burgers at my local Safeway, I immediately picked up all four flavors to try. I’m totally into plant-based foods this year so I was thrilled when I looked at the ingredients and found all natural, organic, non-GMO veggies and grains in these new veggie burgers. The burgers are available in four delicious flavors – 3 vegetarian options and 1 vegan option including Southwestern Style Black Bean Patties (Ovo-Vegetarian), Mushroom Veggie Patties (Lacto-Vegetarian), Sweet Potato Veggie Patties (Ovo-Vegetarian) and Quinoa & Kale Veggie Patties (Vegan). Eat the new veggie patties as a burger on a bun, eat wrapped in lettuce, on it’s own, or with condiments of your choice. I love dijon mustard, salsa, tomatoes, avocados and a touch of balsamic glaze on my veggie burgers. These are also perfect to take camping (weather permitting, of course), to a BBQ in the park, or have on hand for any meatless Monday meal you want to enjoy with your family. Get your serving of veggies for the day in a burger! 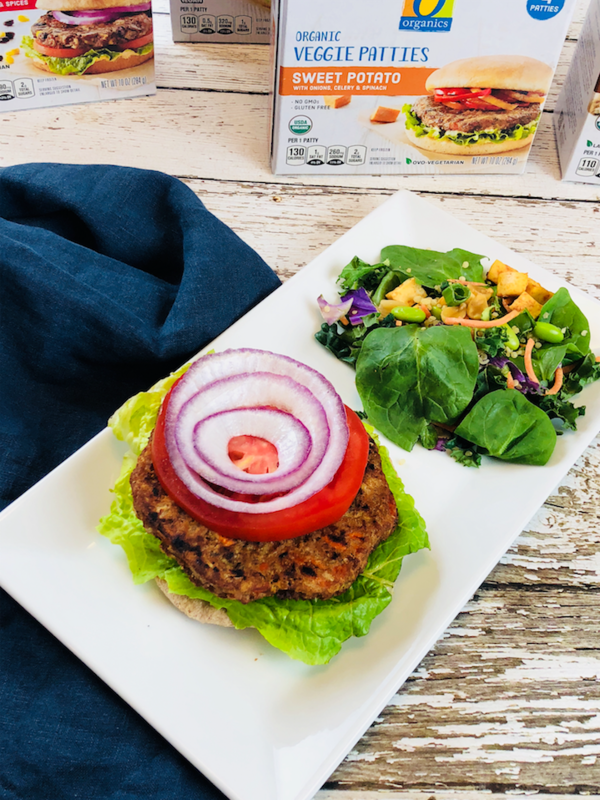 The O Organics veggie burgers have whole, simple ingredients like organic kale, organic carrots, organic onion, organic quinoa, chopped almonds, salt and garlic – I mean – that’s incredible and they taste incredible too! When you look at the veggie burger market there have been just a couple of BIG players until recently, and when you compare the list of ingredients actually in the conventional veggie burgers, you will see a long list of soy by-products and unpronounceable ingredients in most of the other veggie burgers on the market! I had resorted to making my own bean burgers because of my dissatisfaction with the veggie burgers out there. In fact I’ve shared 2 fabulous whole food bean burgers on the blog before. Check out the delicious homemade black bean burger recipe here and my white bean burger recipe here. The Sweet Potato veggie burger is super flavorful with a savory sautéed veggie flavor profile. Full of baby chunks of sweet potato, I definitely tasted the sautéed celery, onions and carrots and I got a welcome little crunch from the sunflower seeds. The texture of the sweet potato burger is definitely more light and airy than the other veggie burgers which have a heartier texture. The Sweet Potato Burgers have 130 calories, 7 grams of fat, 16 carbs and 3 grams of protein per patty. The ingredients include organic sweet potatoes, organic onions, organic celery, organic spinach, organic brown rice flour, organic sunflower seeds, organic egg whites, organic soybean oil, sea salt and organic spices. The quinoa burgers are incredibly flavorful for a vegan burger and they held together really well, which surprised me. You get a strong carrot, onion, celery flavor with a nice crunch from the cooked almonds. There are 130 calories, 5 grams of fat, 18 total carbs and 4 grams of protein in the quinoa burgers. The ingredients include: organic kale, organic carrots, organic onion, organic quinoa, chopped almonds, salt and garlic. An absolutely delicious black bean burger – the first flavor you get is cumin spice, then a subtle chipotle and chili pepper flavor that enhances the black beans, corn and brown rice that are visible in the burgers. While not spicy, they definitely have a southwest kick to them. These burgers are Ovo-Vegetarian, which means they have eggs but they are gluten free. 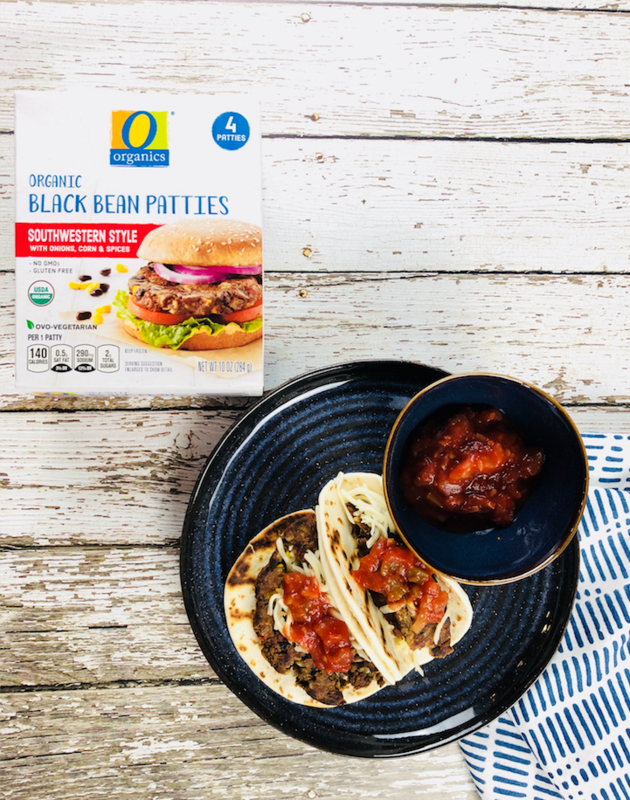 I love to prepare black bean burgers into strips that I use in black bean tacos in a street taco size flour tortilla with a touch of shredded cheese and salsa for a quick and easy lunch or dinner. You can also crumble and toss in a salad to get 6 grams of plant-based protein. Ingredients include organic black beans, organic sweet corn, organic onions, organic tomatoes in organic tomato juice, organic brown rice, organic brown rice flour, organic egg whites, organic pea protein, organic cornstarch, organic chili and chipotle peppers, organic spices, organic red bell pepper powder, organic garlic, organic sugar and sea salt. The black bean burgers have 140 calories, 19 carbs and 6 grams of protein in each patty. Sautéed celery, carrots and mushrooms make up the flavor profile for this burger. It’s really delicious and would be perfect for a lunch or dinner as a burger or The mushroom burgers are lacto-vegetarian, which means they have milk from the cheddar cheese and these are not gluten free like the sweet potato and black bean burgers. Ingredients: organic mushrooms, organic brown rice cooked in water, organic carrots, organic celery, organic whole wheat flour, organic soybean oil, organic oats, organic white cheddar cheese, organic red bell pepper powder, organic onion powder, sea salt and organic garlic. The Mushroom Veggie burgers have 110 calories, 4.5 grams of fat, 16 carbs and 3 grams of protein per patty. 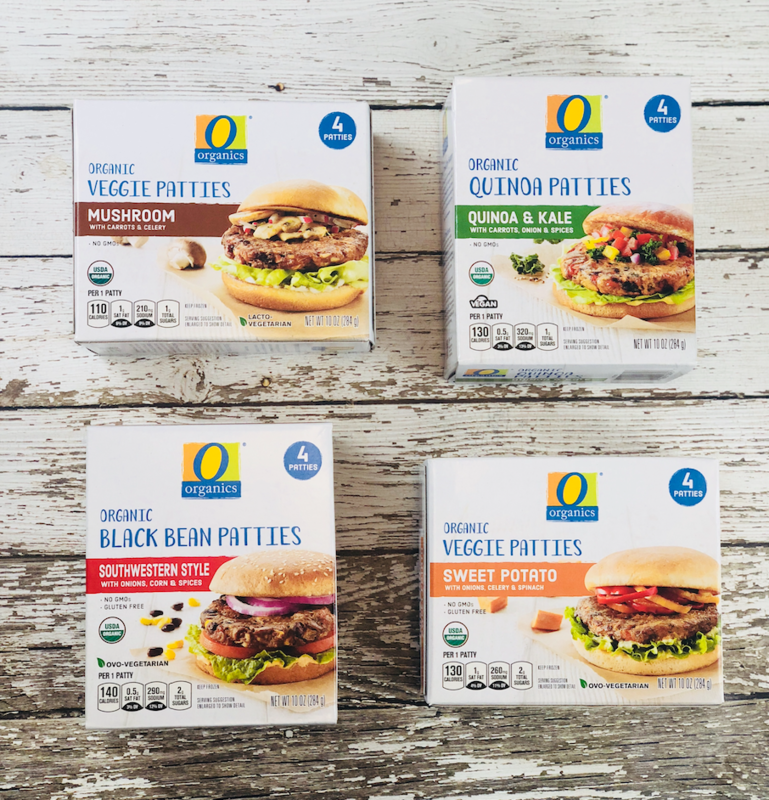 You can find the new O Organics Veggie Burgers in the frozen foods aisle near the frozen vegetables. They are priced $4.99 for 4 organic veggie burgers. I think this is a really great price for what you get. All natural, organic, non-GMO ingredients in 4 burgers for under $5! I’ll take that all day long compared to the alternatives in the veggie burger aisle. If I had to choose one of the burgers I would pick the black bean burgers first, followed by the mushroom, the quinoa and then the sweet potato burgers. You really can’t go wrong and they each have unique flavor profiles, depending on what mood you are in. 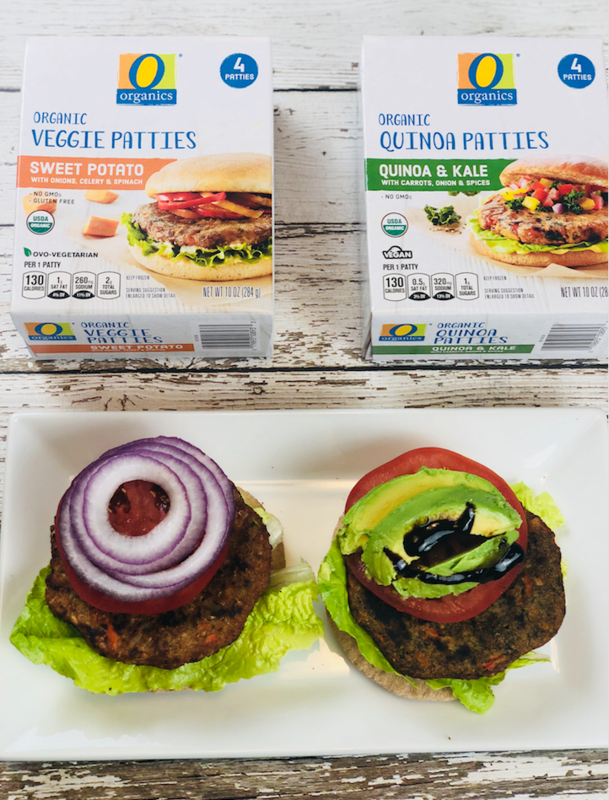 This is a sponsored post – I received the veggie burgers from Safeway for my review – but as always opinions are my own and I would have written the review anyway to promote these fabulous new veggie burgers for my plant-based readers. Thanks for the post. They definitely sound like they’re worth trying out.